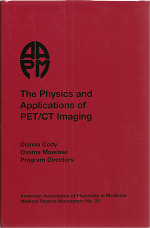 #33 The Physics and Applications of PET/CT Imaging (AAPM 2008 Summer School) (CD-ROM Version) Price Reduced! Since the mid-1990s, the functional capabilities of PET have been combined with anatomical imaging of computed tomography (CT) to produce hybrid PET-CT scanners. Today, all clinical scanners being delivered are PET-CT scanners. Given this, the 2008 AAPM summer school addressed PET/CT imaging by bringing together an outstanding mix of researchers and practitioners. Topics include PET and CT basics, diagnostic and clinical applications, PET/CT scanner designs and characteristics, scanner testing, PET ACR accreditation and acceptance testing, PET/CT simulation for therapy applications, shielding calculations and radiation safety, and site planning.